Backcountry skiing is a chance for skiers to break the cycle of crowds and lift lines and try a different approach to this sport! 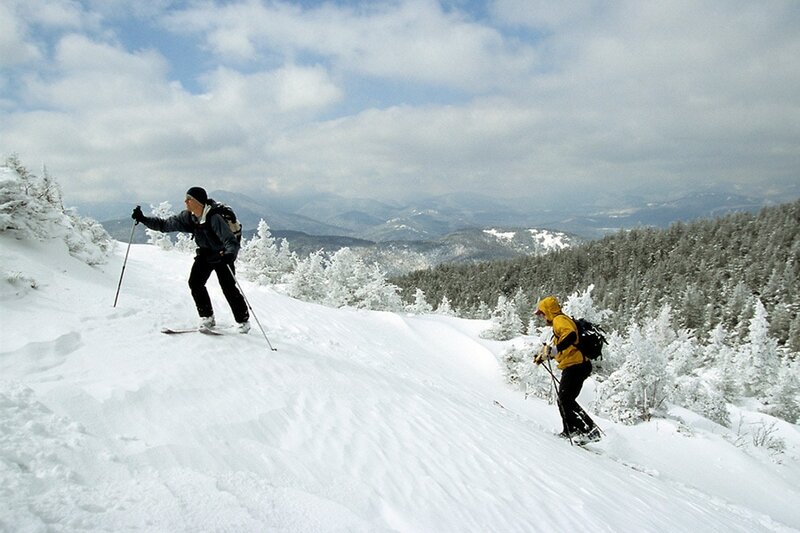 We guide in a number of areas in the White Mountains of New Hampshire that have classic backcountry ski terrain. This ranges from the incredibly steep eastern slope of Mt. Washington to the moderate backcountry trails of Mt.Garfield and Doublehead. 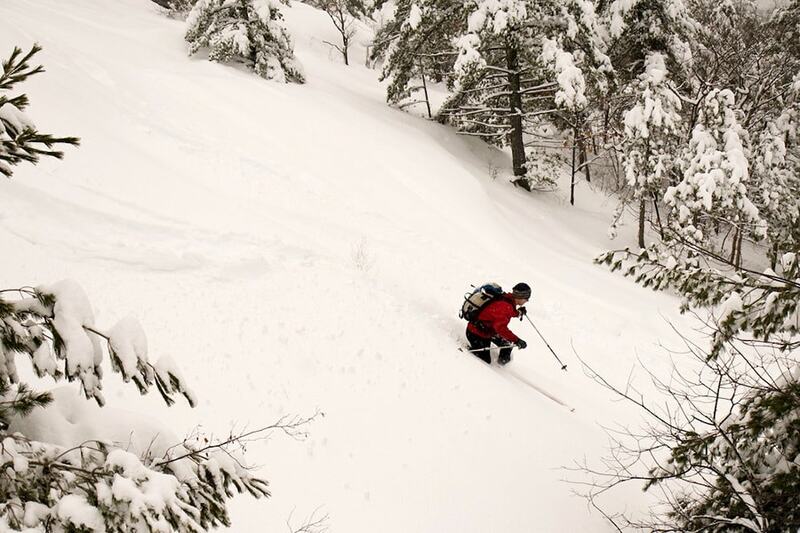 Backcountry skiing in the Northeast has always been very conditions dependent but most winters if you are flexible with your time quite a few ski able days can be squeezed in. A number of tours offer a more laid back approach to skiing including below treeline on old classic ski trails that were cut back in the 1930s by the Civilian Conservation Core and wide logging and fire tower roads. The majority of the terrain that we typically guide is intermediate to expert but we are willing to ski and guide on almost any terrain including classic backcountry traverses and a few select 3000-4000 foot summits. The steep terrain surrounding Mt. Washington is best termed “ski mountaineering” with full avalanche, crampon and ice axe knowledge needed before venturing there. If you are looking to ski Mt. Washington, please see the Mount Washington Ski Mountaineering course. Moderate tours are for skiers that are comfortable on green trails at ski areas. More difficult tours can be skied by lower intermediate skiers that ski both blue and green runs at the ski areas. Most difficult tours are best attempted by skiers that ski blue intermediate trails and black diamonds on a regular basis. We mostly guide on alpine touring (AT) gear but can also use steel edged cross country skis and telemark gear appropriate for the conditions. We can provide beacons, probes, shovels, axes and crampons for Ski Mountaineering programs and can arrange to help with rental ski gear. Skis, poles and boot rentals will be an additional charge not included in the advertised daily rates if needed. A guidebook “Best Backcountry Skiing in the Northeast” by David Goodman, (Appalachian Mountain Club books) documents a lot of the best tours in our area and is a good reference to what is available to ski. We also know of many other areas not in guidebooks close to North Conway that offer great tree skiing and a fun day out in the snow. If you are a skier looking to break out of the ski area boundaries and wanting a little guidance or just need some solid company in the backcountry IMCS can help you out! Give us a call at 603-356-7064 and talk to one of our knowledgeable staff about making your skiing high ambitions happen! To purchase Best Backcountry Skiing ($19.95) call IME 603-356-7013 and we will mail one out to you!